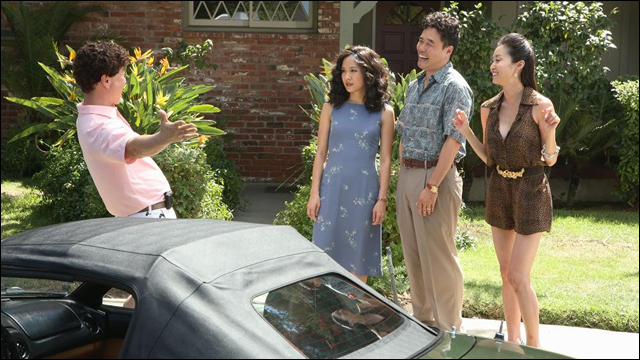 Okay, so as you're probably aware, the new Asian American family sitcom Fresh Off The Boat this week. If you can't tell, I'm pretty excited about it. The long-awaited comedy premieres this Wednesday, February 4 with a two-episode preview at 8:30pm and 9:30pm (before and after Modern Family) on ABC. Then the show settles into its regular time slot on Tuesday, February 10 at 8:00pm, followed by another episode at 8:30pm. It's 1995 and 11-year-old hip-hop loving Eddie Huang has just moved with his family from Chinatown in Washington D.C. to suburban Orlando. They quickly discover things are very different there. Orlando doesn't even have a Chinatown -- unless you count the Huang house. Eddie's dad, Louis, has dragged the family to the ‘burbs to pursue his version of the American dream, opening Cattleman's Ranch Steakhouse, a struggling western-themed restaurant. Louis thinks that the best way to get customers in the door is to hire a white host to greet them and make them feel comfortable. Eddie's mom, Jessica, has agreed to the move, but she finds Orlando a strange place -- from the rollerblading stay-at-home moms, to the hospital-like grocery stores, to the fact that the humidity has ruined her hair. 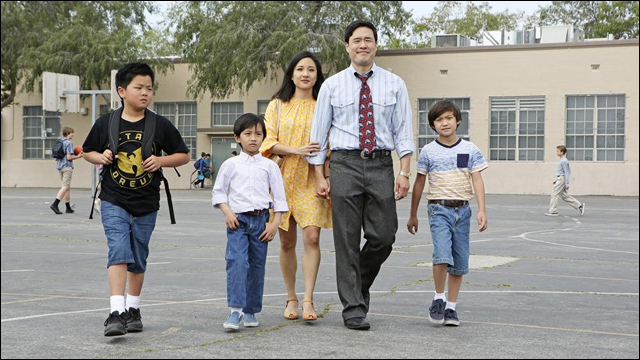 Inspired by a true story, "Fresh Off the Boat" stars Randall Park as Louis, Constance Wu as Jessica, Hudson Yang as Eddie, Forrest Wheeler as Emery and Ian Chen as Evan. 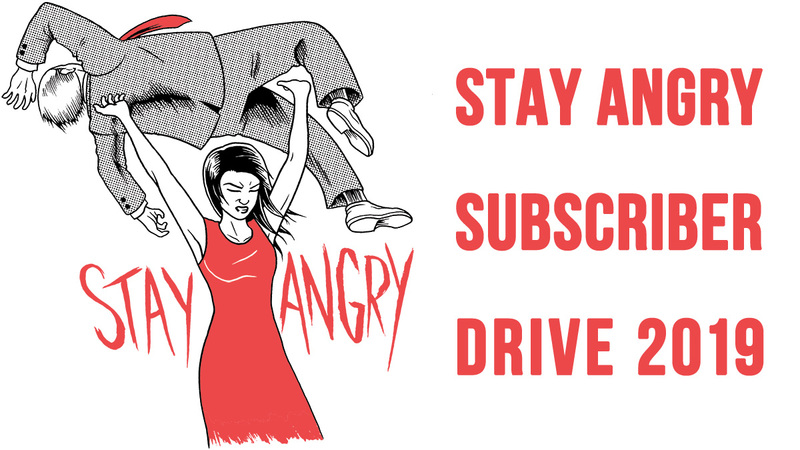 Eddie Huang provides the voice over narration. Guest starring are Lucille Soong as Grandma Huang and Paul Scheer as Mitch. 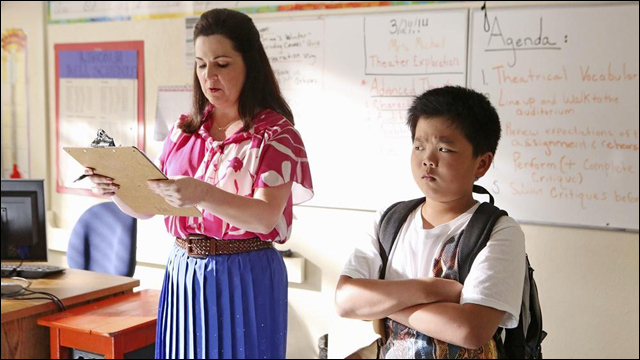 "Fresh Off the Boat," "Pilot," was written by Nahnatchka Khan, who also serves as executive producer. Lynn Shelton directed the pilot. Jake Kasdan and Melvin Mar are executive producers, and Eddie Huang is producer. The series is produced by 20th Century Fox Television. Louis and Jessica clash over how to raise the kids and how to run the restaurant. When the boys get straight A's in school, Jessica decides that their school must be too easy and takes it upon herself to give them more homework and tutor them after class. She takes the same strict approach at the restaurant (no extra croutons for anyone! ), so it's up to Louis to get her to lighten up on everyone. Guest starring are Lucille Soong as Grandma Huang, Paul Scheer as Mitch and Jillian Armenante as Nancy. "Home Sweet Home-School" was written by Kourtney Kang. Max Winkler directed. 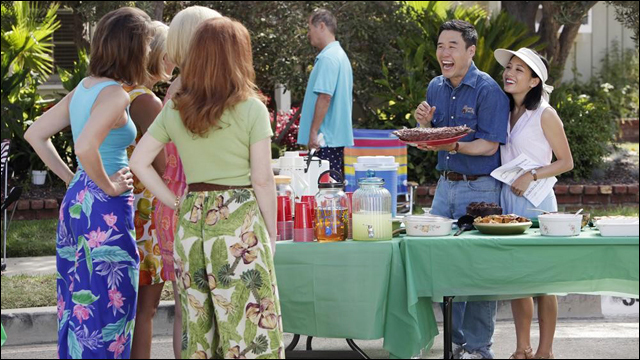 When the cul-de-sac plans a block party to celebrate NASCAR, Louis urges the family to use the event to make new friends (and promote Cattleman's Ranch Steakhouse). But Jessica has problems fitting in, especially after she befriends a beautiful trophy wife the roller blade moms don't like. Meanwhile, Eddie schemes to win the respect of the neighborhood kids. Guest starring are Lucille Soong as Grandma Huang, Paul Scheer as Mitch, Chelsey Crisp as Honey, Ray Wise as Marvin and Rachel Cannon as Deidre. "The Shunning" was written by Nahnatchka Khan. Jake Kasdan directed. Family rivalry spirals out of control when Jessica's sister, Connie, and her far more affluent husband come to visit. The Huangs try to convince everyone they're doing great financially, when nothing could be further from the truth. Meanwhile, Eddie is excited to be reunited with his cousin Justin, who introduced him to hip hop, until he learns the kid has moved on to grunge. Guest starring are Lucille Soong as Grandma Huang, Paul Scheer as Mitch, Jillian Armenante as Nancy, Noel Gugliemi as Hector, Charlie Soong Lee as Steve Chen, Susan Park as Connie Chen, Lance Dae Lim as Justin Chen and Shu Lan Tuan as Grandma Chen. "Success Perm" was written by Rich Blomquist. Gail Mancuso directed. 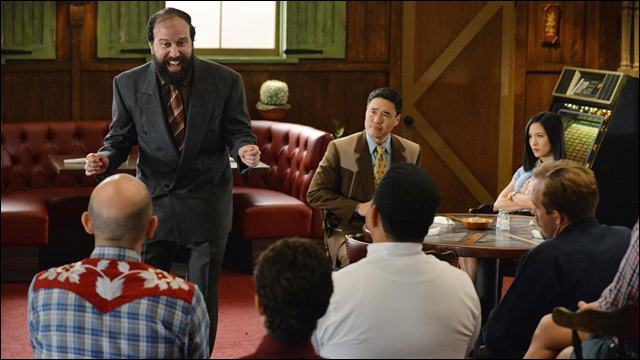 Louis has to hire a professional instructor (guest star Brett Gelman) to give the restaurant staff a sexual harassment seminar after Jessica's attempts fall flat. Meanwhile, Eddie tries to pass off the seminar's instructional tape as a "dirty movie" to his friends in an attempt to impress them and get them to come to his house for a sleep over. 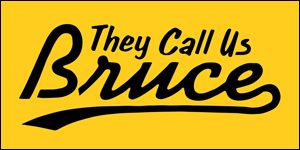 Guest starring are Lucille Soong as Grandma Huang, Paul Scheer as Mitch, Jillian Armenante as Nancy, Chelsey Crisp as Honey, Brett Gelman as Dusty Nugget, Brady Tutton as Brock, Connor Rosen as Bed-Wetter Doug, Trevor Larcom as Trent, Prophet Bolden as Walter, Elyse Cole as Stacy, Peter Mark as Kevin, Luna Blaise as Nicole and David Goldman as Principal Hunger. "Persistent Romeo" was written by Sanjay Shah. Lynn Shelton directed.